So my wife–who is eight and 1/2 months pregnant–walks to the grocery store this morning. She buys some bread and cereal, walks back. After getting back she says, “There’s something going on at Sultanahmet—there were a bunch of police and ambulances and stuff.” They were not there when she walked past it on the way to the grocery store, but were present, with more converging on the place, as she walked back. We check the internet to see if anything happened there, but nothing’s on the news, so we dismiss it. Then, about 45 minutes later, our friend Russ (who had arrived for a visit a few days before) receives a text from a friend asking if he’s safe. That’s when we find out there had been a suicide bombing about 2 blocks from where we’re staying, in a square that she walked right past in order to get to, and from, the grocery store. Thirteen people had been killed, fourteen more injured. Ali didn’t notice the blast noise when it happened (nor did Russ and I, who were at the apartment), though we had all been close enough to hear it if we had known what it was. We probably heard the noise and dismissed it, as you do a car backfiring a few streets away. This CNN article says the blast was set off at “around 10:20am” local time. The U.S. Consolate says it happened at about 10:15am. Her grocery store receipt is time-stamped 10:17am. 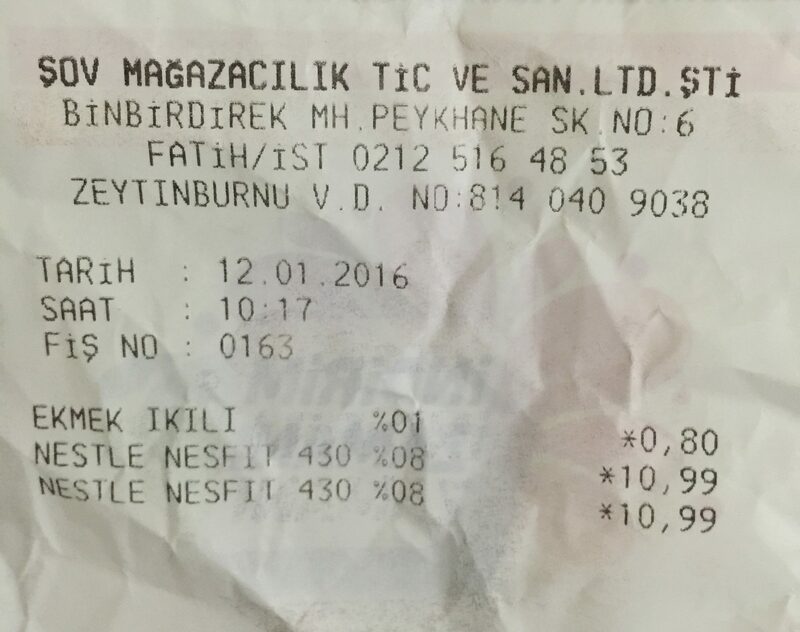 You can see on her receipt the address and time stamp. The Nestle items are cereal, though chocolate would have been a good guess; an urgent need for chocolate at 10 in the morning is not uncommon around here. In other words, the suicide bombing happened between where we’re staying and the grocery store, and my wife was getting groceries at the time, or had just finished and was walking back from the store, when it happened. 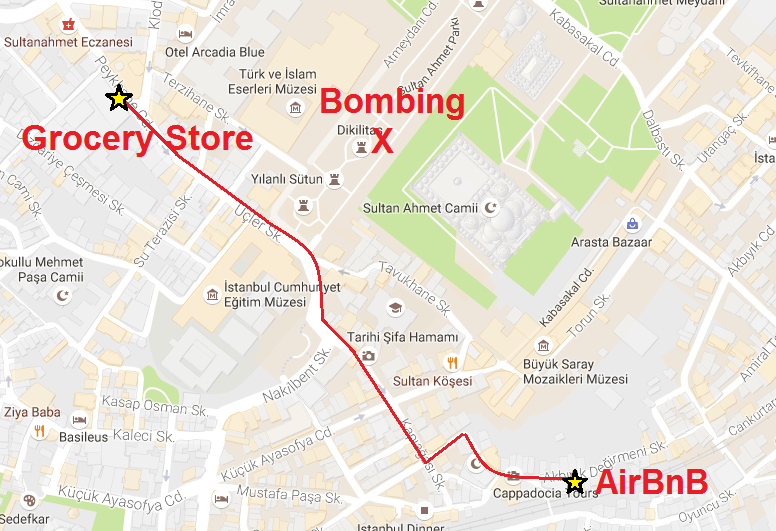 Here you can see the path Ali took from the AirBnB to the grocery store, and how close that path gets to the bombing. Just 100m and a few minutes on either side is the difference between life and death on that day. Google Maps says she walked about hundred yards–the length of a football field–away from where it happened (she was walking on the edge of the square, not directly through it), and passed by it a few minutes before it happened (walking to the store) and passed by again a few minutes after it happened (walking home). We all had a big WHOA moment when we realized all this. I’m glad she isn’t dead. I’m sad for the people who are. So naturally, afterwards, people asked us: Are we going to stop traveling? Are we ready to come home? Image courtesy of Rick Steves. About safety, I believe this is an isolated incident. Tomorrow Paris will be no more dangerous than it was the day before that terrible Friday the 13th. I also believe that security in Paris and throughout Europe will be heightened in response to this attack. Remember: There’s an important difference between fear and risk. I agreed with him at the time and even now, having had my wife and unborn child get about as close to an event like this as one can get without getting blood on them, I believe it just as strongly. I understand risk, and believe in numbers, not decisions based in fear. Many of you all reading this, driving daily to work, are at a much higher risk of dying from that, than we are from a terrorist attack. If we changed our plans due to a small chance of something like that happening to us, we would be giving into the exact fear the people doing these bombings want. Events like these remind us how much we all owe to random chance. This near miss with death [caught your attention] because you have awareness of its (non)occurrence, but I often marvel at the infinite number of possible ways our fragile bodies of flesh and bone avoid meeting death and dismemberment every single day that mostly go unnoticed (not to mention the infinite number of alternative possibilities that could have transpired in lieu of the impossibly unique butterfly-effect chain of events, leading back to the beginning of time, that we each have to thank for our existence in the first place). Yesterday too was a day your wife (and unborn child) did not die, and the day before that, and the day before that. How miraculous is that, if you really stop and think about it? I heartily agree. This bombing was a reminder for us of how fragile everything can be, and his message was a reminder of how fragile it always is. I’m grateful for our lives, and the lives of all of you reading this, and in mourning for those lives lost due to this attack. Hi Man, Stumbled upon this place months ago from your review over at JL Collins but at the time all you had was the About and home page up. Nice to see you’ve got some content. I remember when I read your post about this in “real” time back in January. Totally agree with your sentiment on risk and the average commuter having a higher chance of death in car accident than you in a terrorist attack. I’ve used the same argument when people have questioned some of my outdoor activities (skiing and the like). I’ll take the risk of getting injured/killed doing something I love over the risk of sitting on the couch instead!! Glad that all is well with the three of you. Safe travels! I read your post on MMM forums after this happened and I related this story pretty often to friends and family when they would mention overseas travel is dangerous. The truth is a very tiny percentage of people die from terrorist attacks every year, and I can’t say I feel much safer here in Raleigh North Carolina where we occasionally (frequently??) have multiple shooting deaths during one week. And we all drive on roads even though tens of thousands die every year and millions suffer injuries. I suppose the safest place on earth might be a treadmill-equipped fireproof cement bomb shelter, though I’d surely die of boredom before old age takes me of natural causes. And it wouldn’t be a very enjoyable life no matter how long it lasts.